This recession looks very different, and much more troubling, than those in the recent past. I wonder how this dramatic change in the nature of unemployment will alter traditional macroeconomic relationships, such as Okun's Law and the Phillips curve. 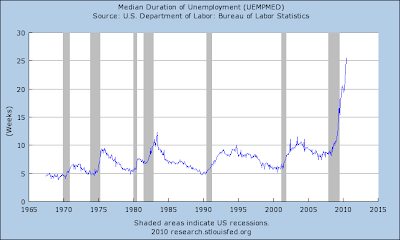 Some research suggests that the long-term unemployed put less downward pressure on inflation. If that is indeed the case, then the increase in long-term unemployment may mean that we will see less deflationary pressure than we might have expected from the high rate of unemployment. 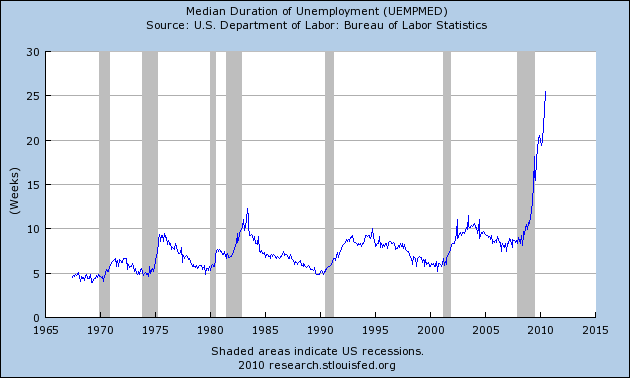 In other words, the NAIRU may have risen, perhaps quite substantially. This is mostly conjecture, however. It seems likely we will see more work on this topic in the coming years.